Home » Valley News » North Conway Village has been packed with shoppers, diners, and families! North Conway Village has been packed with shoppers, diners, and families! North Conway Village, NH: We had one of the best snow-seasons here in the mountain towns of Mt. Washington Valley! North Conway Village has been packed with shoppers, diners, and families riding the Journey to the North Pole or Santa trains…and soon the Easter Bunny Express of the Conway Scenic Railroad. Conway Village just announced the sale of the famous Theater Building as you enter town. It will now be the new home of the Mountaintop Music Center….and Jackson, Bartlett, and Glen businesses saw one of their busiest seasons. This time of year means many things to many people; but to me it means let the Spring-time games begin! It’s time to have some new seasonal fun! While we are still skiing on some of the best snow I have seen or experienced in decades, I am also starting to pull out my golf clubs and road bikes. But, I quickly realized….. I’m kind of sick of last year’s fashion. My solution…… It’s time to SHOP! Just writing this phrase excites me. I used to hate buying new clothes until I moved to the shopping mecca of the universe; North Conway, NH and Mt. Washington Valley. With more than two hundred and fifty factory outlets and specialty shops in and around the Valley, there are literally stores or outlets for EVERYONE! Lucky for me I have my handy Shopping in Mount Washington Valley Map and Guide and the North Conway Village Map. 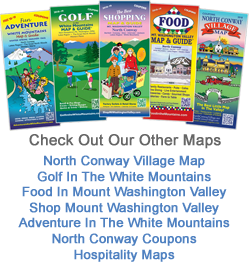 You can pick up your own copy at more than 500 locations worldwide or by going to: shopmtwashingtonvalley.com, hospitalitymaps.com, NorthConwayVillage.com, or NorthConwayCoupons.com . And if you need a great hotel or B&B, be sure to check out the lodging options on all of these websites’ homepages. If you’re not a shopper… let me give you a few words of advice. “It’s all about the strategy!” Check out my shopping tips in the news section of this website. I’m amazed at how many people actually click on the link to this page. I’m psyched people read it but surprised that my Shopping Tips are so popular. So, my plan of attack is to start at one end of the strip and work my way to the other. My first stop is always Bob & Terry’s Sports Outlet to pick up some new Smith shades, (maybe one of their flashy new colors), and also check out their huge selection of road and mountain bikes. I could also use new bike shoes and some fresh base layers; Gore-Tex IS a girl’s best friend you know? Next, I’ll head over to International Mountain Equipment and Climbing School (IME) with my old gear to drop it off in their consignment shop. (The owners of this store are world famous for having summitted Mt. Everest multiple times!) Their consignment section is a great way to earn a little money to purchase my new gear. They have all the best in high tech clothing like Marmot, Patagonia and Mountain Hardwear! Just up the road is the headquarters for The Mt. Washington Valley Cross Country and Snowshoe Center. I ski daily in Whitaker Woods with my dog in winter and 8 months of the year we mountain bike in there, so base layers are truly my best friend as the Spring temps are rising and falling with the sun. Regardless of whether I’m shopping or not, I can’t walk past the Mount Washington Observatory without stopping in to check out the Weather Discovery Center. This place is great for kids and weather geeks like me. And admission is FREE !!! If this isn’t enough White Mountain fun for you, there are amazing photos of the White Mountains at the White Mountain Photography Studio in Jackson. Since I know I’ll need a boost of energy after all this shopping, my next stop will be to Zeb’s General Store. They have a 67-foot long candy counter! In fact, everything in there is Made in New England and there are thousands of items to choose from. The best part is they do free food tastings almost daily. I also strongly suggest the tastings at Stonewall Kitchen in Settlers’ Green. EVERY TIME, I go there and taste something, I end up walking out with a jar or box of some delicious edible. And at Lindt Chocolate, they give you a FREE sample the second you walk in!!! Yum. So far, I’ve picked up some new outdoor gear and clothing (Be sure to check out Ski and Snowboard Liquidators for their amazing deals, too), so now it’s time to take care of my feet. I love to shop at Beggar’s Pouch and Spruce Hurricane in North Conway Village. Not only can I find great leather shoes from brands like: Dansko and Ugg and Dingo, I can also pick up some beautiful accessories like handmade belts, pocketbooks and vests. Does the name Brighton ring a bell? Regardless of what I’m looking for, I can count on finding something unique and one of a kind; especially leather and suede outerwear at both of these boutiques. As I move down Main Street in the village, I pop into the Bavarian Chocolate Haus. While here I can save $1 if I spend $10 or more, using a coupon from northconwaycoupons.com. What a deal! It’s even better because all their chocolates and fudge are handmade! My fav is their ginormous peanut butter puck. I just got one with a Bruin’s logo on it; it was love at first bite! My second favorite is their dark chocolate dipped apricot! OMG…..soooo good. White Mountain Cupcakery in North Conway Village has an awesome cupcake deal – $1.00 for 4 with their coupon in this map. OK…I am done with munching, so now it’s time to feed my brain. White Birch Book Store is, by far, one of the best book stores I have ever been in! They not only feature the latest in bestsellers, I can get a 10% discount on them with their coupon at northconwaycoupons.com. They review nearly every book in their store and even have monthly book readings, some with famous authors who actually come in for this! Now it’s time to add a little flash to the brainpower. I am heading next door to Assets Jean Company. They have one of the largest selections of jeans north of Boston, the cutest tops, and functional outerwear. The best part is their knowledgeable staff will help me pick out the perfect jeans that are meant for “my” body. The the really good best part is they have a $10.00 OFF coupon in NorthConwayCoupons.com! Speaking of coupons….all of the maps at HospitalityMaps.com or NorthConwayVillage.Com have a coupons page. From 10% off at McGraths Tavern, and two new eateries Abenaki Restaurant and Pub, and Chef’s Market Bistro. Even Headlines has a coupon! Gosh, there are nearly 100 coupons in all of the maps! Share the savings and tell a friend! Whew, all this shopping has made me hungry. This is where my decisions get really tough! There are so many delicious places to eat in the Mt. Washington Valley! 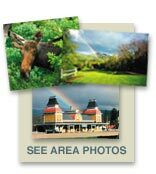 (Check out foodinthemountains.com to see many of the best choices!) I originally thought I was in the mood for a burrito. I LOVE the chicken burritos at Cafe Noche but my stomach is telling me to go to Stonehurst Manor tonight for one of their famous handmade wood fired pizzas. Another option for an awesome meal is Tuckerman’s Tavern. All of their food is delicious and they have 20 beers on tap PLUS a coupon for a FREE appetizer. On second thought, I’m thinking I really want a lobster roll. Merlino’s has THE BEST one I have EVER eaten in my life. Clearly, you can tell I love to eat! After all this, I will definitely need some SPA work at one of the five body services businesses listed in the SPA section of this site. I have used them all and can attest to their awesomeness. Moving on to my four footed friends, I need to head to Four Your Paw’s Only to pick up Keeper’s dog food and treats. Did you know they have a huge pet BAKERY? It’s the biggest pet bakery I have ever seen! Boy, are there going to be some pretty excited pets when I get home! I am happy too, because with my ad from shopmtwashingtonvalley.com I save 15% on Frontline & other flea/tick treatments, pet treats, and toys. This is a big savings for our furry friends. And BTW, you can bring your pets with you next time because Karla’s Pet Rendezvous in Conway is a daycare/playcare facility and even cares for birds! They are amazing and even have a Vet on the premises. My last stop of the day will be to pick up a few birthday gifts. The Local Grocer has green earth friendly gifts. One shop I also HAVE to get to today is the League of NH Craftsmen for fine quality made clothing, jewelry and crafts. For that one• of • a • kind friend….this is the place to look for a special gift. Phew, I’m exhausted! My final stops will be my “reward” stops. First, I’m going to quench my thirst with a specialty martini at The Stonehurst Manor, or maybe at Vito Marcello’s Italian Bistro…… and then I will head to the Chef’s Market Bistro for one of their nightly specials. I had the Haddock last week and it was perfectly cooked and fresh not frozen. I’ll be writing more soon in the FoodintheMountains.com website about all the amazing foody finds to be had in the Valley. Be sure to check that out, too. There are so many choices to make when you visit North Conway and its quaint Village. Today’s stops are just the TIP of the New England iceberg also known as Mt. Washington Valley. Safe travels to you and yours!